The 8 old ladies are part of the family and lay gold-yoked eggs. My proposal for this residency is to make and install a Suikinkutsu (trans. Water Koto Cave); an underground echo chamber which amplifies the sound of water trickling into it; they often form part of the hand-washing ritual of the Tea Ceremony. The idea is that it is an integral part of the site, using site-specific water and where possible materials. The studio hosts a regular Mindfulness Retreat and George and Claire are excited that the Suikinkutsu could form part of it. We spent some time wandering around the garden this morning considering sites for the Suikinkutsu and an associated walk for contemplation. A beach boulder that George carved will form the basin of the Suikinkitsu. We're investigating a solar fountain to feed it...? 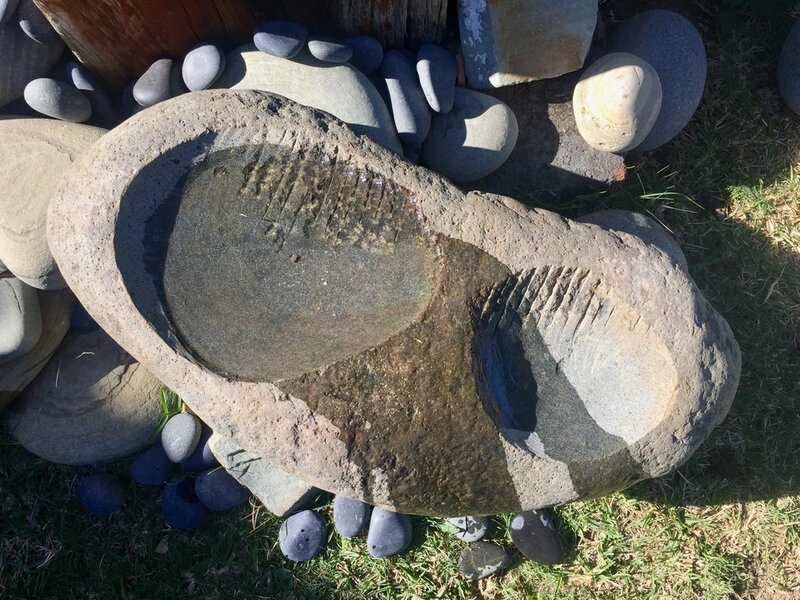 George has carved shallow large Kwelera beach pebble with shallow basins. It's been knocking around his storage area for a while- it's time has come! The surrounding forest is home to lots of different birds. Hornbills, Hardeedas, Golden Orioles, Green pigeons.George explains that they tend to fly a certain path across the site on the line of an old track. I'm very curious and ask if he has some divining rods. "No" he says, and sets too! They Will have brass rods and turned drift-wood handles; I suspect the Earth-energies will be strong here and I'm wondering how they might effect the work. It gets pitch-black dark about 6pm and we have home-made pasta for supper and then watch 'The Truman Show'; a good film to revisit about the quest for authenticity. '65 Minutes for Mandela' is a national community project to mark his birthday. We go and pick-up plastic off the beach - here it is... 'Shadow Treasure'. The stars in the Southern sky are bright and intense and the milky way stretches across its breadth. Wonderful.